A couple posts back, I mentioned a mini-ornament swap my friend Dawn and I did this holiday season. It took me a really long time to decide what to make. I had no idea... Until one night while I was trying to fall asleep, it came to me - Gram’s Ice Skates. I got out of bed right then and headed to the basement to search them out. Of course, the ornaments were in the very back of the storage room! Sorta how it always happens, right? Want to know how I made them? I took pictures along the way, so I figure it will be just as easy to write a little tutorial as I describe them. Gathering all my supplies would have been really easy if I didn’t have to wait in line for 30 minutes at the fabric store for 1/2 yard of fabric (1/4 yard gave me enough for 12 sets – yes, I started out planning to make just one set, but then I decided I might need to make one for everyone in my family too). 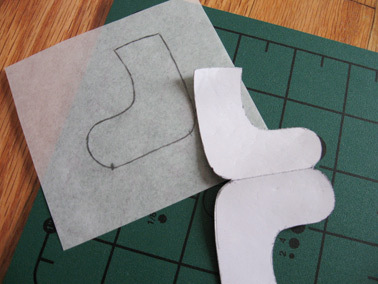 I traced my pattern (you can download it here) onto the felt and the batting and cut them out. On the batting, you will then need to trim about 1/8 or so off the edges... Or probably smarter, trim inside the line the first time you cut. Gram’s laces were sequence and beads. I liked her style, so I matched them completely. On one side of each skate (remember, each pair has on right and left, so be sure to bead on correct sides) add 4 sequence, bead combinations. First place the sequence, add the bead and then take the needle back through the hole in the sequence. 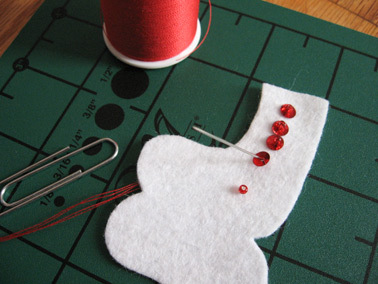 Now it is time to put the pieces together, scoot the felt through the paper clip, so the clip is in the middle of the pattern. I like the double end of the paper clip to be the toe-pick. 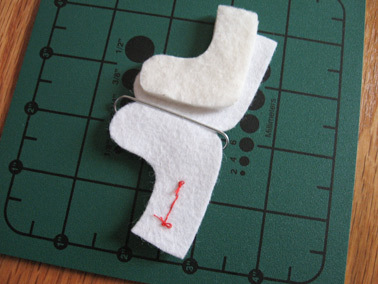 Place the batting in the middle and fold the felt. I then pinned it together with a long quilting pin. It really only needs one and I even tossed that one aside once I got going on the embroidery. When I finished both skates, I tied the ribbons together so that one skate was higher than the other. This is so much like how I used to carry my skates as a kid... Just without the skate guards. Pretty simple... Unless you are making 12 pairs! hey! 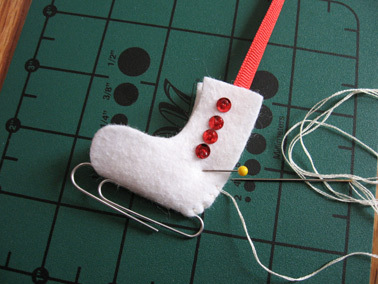 So So cute, I showed this project to my crafty dollar and she can't stop making them! thanks your post, i want to learn it. These are so very cute! 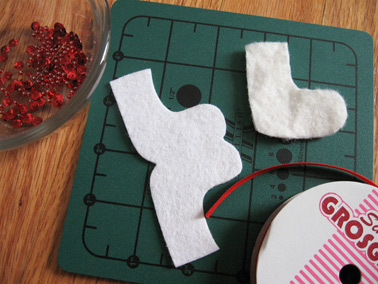 I was recently refered to your blog to read more about how to make these cute little felt skates. I want to remember to do these with my ornament club group next year, so I am creating a link on my blog. Thank you so much for the tutorial. Thank you so much for posting this adorable idea and for the great photos and directions! I am starting some of these today and am excited about them. 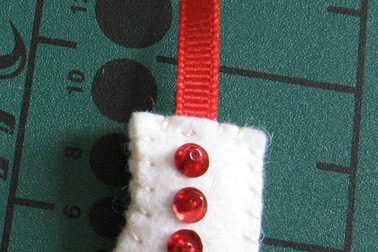 I am using a 9x12 sheet of glitter felt (35 cents at Jo-Anns)and was able to fit 6 pair easily, using your template. 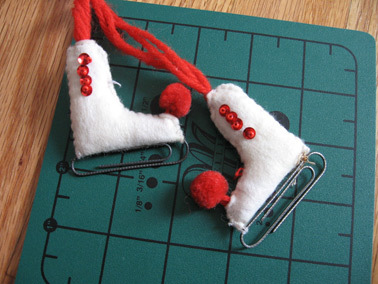 I also got teeny jingle bells and I'm going to sew them onto the toe in place of the pom-poms. Thanks again!!!! Thank you for a lovely tutorial, Merry Christmas. OMGosh I still have some of those ornaments that my mom made many years ago!!! Thanks for the memory and the tutorial!! I miss the old home-made ornaments my aunts used to make every Christmas. Time to bring back the tradition. 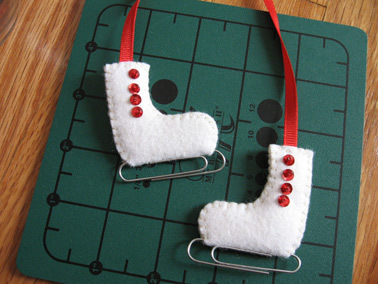 And also perfect to make for our next skating party for a little take-home. Thanks for sharing!